CCMS is pleased to recognize local physician leaders at its 2019 Annual Meeting & Installation, May 4th at Wyndemere Country Club. 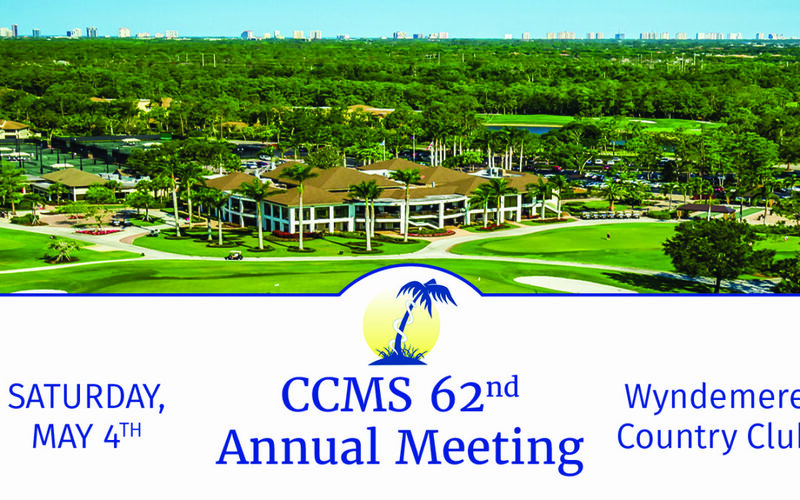 The evening features the inauguration of the 62nd CCMS President, Dr. David Wilkinson and new CCMS officers; the presentation of the 2019 Physician of the Year Award to Dr. Cesar De Leon; and the CCMS Lifetime Achievement Award to Dr. Robert Meli. The Florida Medical Association President, Dr. Corey Howard of Naples, will preside over the installation ceremony. CCMS is pleased to host its 11th Annual Women’s Health Forum – “Advances in Women’s Health” – February 23, 8:30am-1:00pm at Naples United Church of Christ. This free health education event is open to the public; please register online. 1 2 3FMA Annual MeetingFMA Annual MeetingThe 2018 FMA Annual Meeting offers CME sessions to help you maintain your Florida license & address key issues that affect FL-licensed physicians, as well as the House of Delegates proceedings and the inauguration of CCMS member Dr. Corey Howard as FMA president. 4FMA Annual MeetingFMA Annual MeetingThe 2018 FMA Annual Meeting offers CME sessions to help you maintain your Florida license & address key issues that affect FL-licensed physicians, as well as the House of Delegates proceedings and the inauguration of CCMS member Dr. Corey Howard as FMA president. 5FMA Annual MeetingFMA Annual MeetingThe 2018 FMA Annual Meeting offers CME sessions to help you maintain your Florida license & address key issues that affect FL-licensed physicians, as well as the House of Delegates proceedings and the inauguration of CCMS member Dr. Corey Howard as FMA president. A complimentary event for Alliance members and their families, join us poolside for food and fun in the sun. The Alliance will provide lunch and drinks. Bring towels, floats and an alcoholic beverage to share if you would like. Please RSVP by August 16th at colliercountymsa@gmail.com.